Back in fifties, everybody had an opinion about rock ’n’ roll and Elvis Presley. Music and entertainment pundits generally condemned both the musical style and its leading proponent. At the other end of the spectrum, teenagers generally embraced rock ’n’ roll and worshiped Elvis as its king. Of course, some critics accepted Elvis and some youths hated him. With so many emotional viewpoints being aired, it was hard to get a handle on Presley’s actual influence on popular culture. At that time, people didn’t have the scientific polling that we depend so much on these days to define societal trends. There was one man, however, who tried to quantify the concerns of young people in the fifties. Eugene Gilbert, who billed himself as “President of the Gilbert Youth Research Company,” wrote a weekly syndicated newspaper column under the banner, “What Young People Think.” Each week he published and commented on a topic about which his company had surveyed teenagers and their parents across the country. Eight months later, however, Gilbert’s survey of teenagers across the nation found the number of Presley’s defenders had dropped considerably. 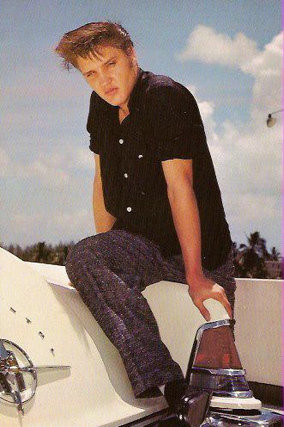 The week of March 17, 1957, Gilbert opened his “What Young People Think” column with the following statement: “Singer Elvis Presley’s phenomenal popularity among the Nation’s teen-agers seems to have taken a nosedive.” He noted that in his nationwide survey the previous October, 35 percent of youngsters listed Elvis as their favorite male singer. But in his most recent poll, that number had dropped down to 21 percent. “That’s still a hefty following—and also a remarkable decline,” Gilbert concluded. 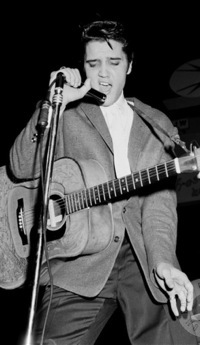 Gilbert offered several other results from his March survey concerning Elvis. First, at 21 percent Presley still topped the “Most Favorite Male Vocalist” category, although Pat Boone, with 13 percent of the vote, was moving up strongly and threatened to depose the King. Later in the summer of 1957, Gilbert engaged in what he called “motivational research” to determine “what sort of teen-ager really likes Elvis Presley—idolizes him from the top of his bushy brown hair to the soles of his blue suede shoes?” He started by questioning 100 random teenagers about their school activities, grades, and future plans. From their responses, Gilbert established a pattern for the average teenager. He then used that pattern to come up with a sketch of a typical Presley fan. In analyzing these findings, Gilbert’s staff started with the sociological assumption that the typical teenager is faced with a dilemma: “More and more demands are being imposed upon him by the adult world, yet he still clings to his dependent, infantile existence of former years.” Gilbert’s researchers then came to the following conclusion. • "How long will Presley’s popularity last?" Despite what Eugene Gilbert’s poll indicated, the Presley “fad” was far from being on the skids. The week after Gilbert’s March column appeared in newspapers, a gold lamé clad Elvis opened his 1957 spring concert tour in Chicago. Huge crowds came out to see him in most of the 18 cities he played that year. 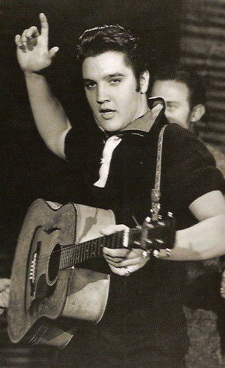 His April single release, “All Shook Up,” shot up Billboard’s “Hot 100” and stayed there for 30 weeks. Two more #1 hit records, “Teddy Bear” and “Jailhouse Rock,” followed, both from highly successful Presley movies. As a result, Presley’s name again showed up in Gilbert’s “What Young People Think” column early in October 1957. The survey question this time was, “Who would you like to be most like when you grow up?” President Eisenhower easily topped the boys’ list with 31 percent of the vote. Elvis Presley, though, came in second with 14 percent. That was more than twice what Vice President Richard Nixon earned in third place. Others finishing well below Elvis were Babe Ruth, John D. Rockefeller, Mickey Mantle, and Albert Schweitzer. Eugene Gilbert never used the term “scientific” in reference to the polling he did for his “What Young People Think” columns in the fifties. No doubt his methods were primitive compared to those of modern pollsters. For his time, however, Gilbert’s nationwide surveys at least brought some fairness to the emotional Presley controversy. His poll numbers lent some reasonableness to the debate, and he was always careful to make sure both sides had their say. "Through an alliance of the spirit with Presley, the teen-ager is able to act out his infantile desires of striving for power through the destruction of adult standards."